Sightly is introduced with the release of AEM 6.0 version, to make component development as a job of UI developer from Java developer’s. AEM insured that components written is Sightly are compatible with components written in JSP, so that both type of components gets supported with AEM 6.x versions. The focus of this tutorials is to learn how to create Sightly component in AEM(Adobe experience Manager). Create a Template, Page and a Basic Component as shown in previous tutorial. Modify the basic Component to be used as a Sightly Component. 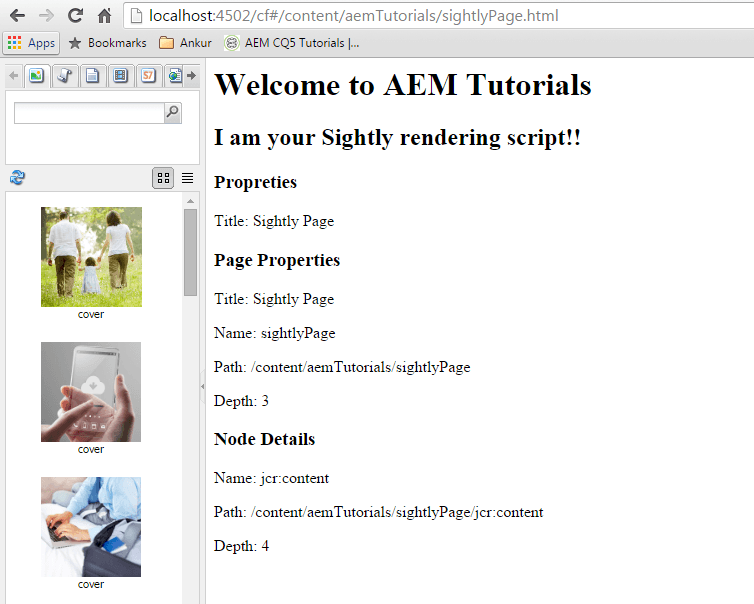 Creating a Sightly component in AEM is very easy and has many advantages over traditional jsp component in aem. Like all HTML editor supports sightly code , you can leverage all features of editor like syntax highlighting , formatting etc. In Crxde , Navigate to /apps/training/components/ . 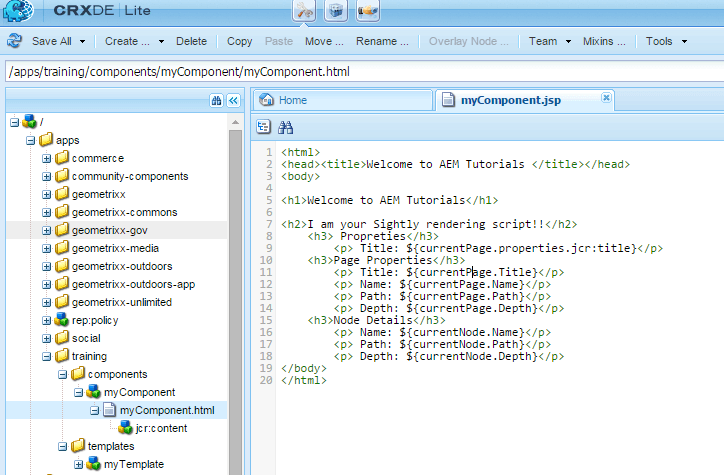 Select myComponent.jsp under /apps/training/components/ and rename it to myComponent.html or you can delete existing jsp file and create a new html file with same name. Double click on myComponent.html . Lets use API’s to display basic page information. Edit myComponent.html and enter below code. Log in to AEM SiteAdmin. 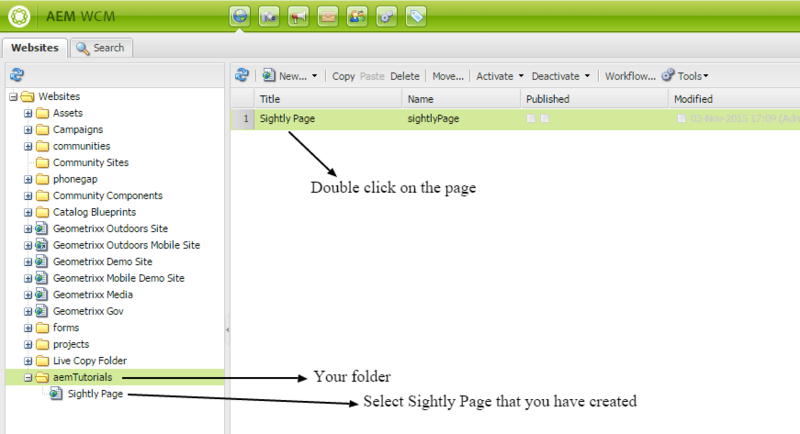 Double click Sightly Page that you have created to render the script. Replace editor.html in the url to cf#(content finder). You have successfully created your first Sightly component. Note:- All Sightly components that we create. AEM stores them under var folder in crxde. 3 Responses to "Create a Basic Sightly Component in AEM"
How do you write a component in sightly that allows user input? Let’s say I was writing a form that takes text input, and when the user presses a button, the text is submitted to a webservice and the results that are returned are displayed. How do you achieve that in sightly? i have got same requirement as Mahendran Govender. Can you please suggest me? please provide some aem developed application URL for my reference.